The Car Shade protects children from the Sun’s damaging harmful rays and annoying glare all year round. 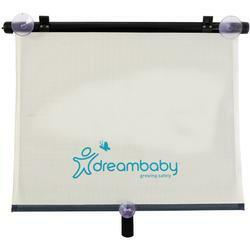 These Dreambaby extra-wide adjustable car shades are 19.5” wide. They are suitable for larger vehicles, SUV’s and trucks. The new Dream Baby Wide Car Shade is great for SUVs, vans and larger cars. The strong suction cups stick to windows. It is UV protected.